All confirmation emails for entries received have been sent out as of Wednesday April 18th. If you sent us something and have not gotten an email back, please contact us asap! We will continue to post updates as we get more entries. Cheers! Please remember the soft deadline with bonus points for early submission is April 24th and the hard deadline is May 1st! Video Programming / 2013 FMV Contest Rules and Guidelines! • New Judge's Point Scale/Extra Points. • Movie Trailers added to Experimental category. All videos must be in the hands of the video coordinator no later than the Hard Deadline of midnight on Wednesday May 1st, 2013. Additional points will be awarded for all entries submitted on the Soft Deadline on or before Wednesday April 24th, 2013. All videos submitted will be tested to make sure that there are no problems with playback. If there are any problems, there is a short amount of time to fix and/or resubmit your work. Remember this isn't school, so don't delay - submit A.S.A.P. If you’re a very busy person, and a lot of us are, please send your videos online. You can send your file over the Internet via filesend.net. filesend.net will handle files up to 500mb in size for free with out registration, and 1GB if you register for the FREE account. There are many other file sharing websites online and you may use any that you want, just don’t send links to any illegal or illicit file hosting websites. Remember all file formatting and type rules still apply. Make sure to send your video to fmv@fanime.com. After the video has made its way to us please send another email with all the info as if it were a mailed entry. ASF, WMV, MKV, Windows Media, Flash/Shockwave Animation, Real Media, and HUFYUV Files are unacceptable. • ACTION - Think Action, Adventure, Horror things that tell an exiting story. • DRAMA - Think Drama, Romance things that tell a story that makes you feel. 15 Points – Quality of Audio selection – “Does the music fit the tone or selection of anime used in your Music Video” and "Does the quality in general sound ok?" 5 Extra points will be given to those that submitted properly – This one must be self evident, you need to submit the right information in the right format. Videos adhere to the submission guidelines regarding formatting, codecs. • The "Best Minute Ever!" Award - Can you make an amazing AMV that clocks in at a minute long or less? • The "Life After Death" Award - Is your AMV focused on the undead? Are the stars of your AMV zombies, vampires, or ghosts? Then this might be for you! saturated with super cuteness, then this might be right up your alley. show it? They can be laughing or blowing things up. It doesn't matter as long as you think they look good doing it. Each genre will have a winner. There will also be two Best of Show awards chosen out of all submissions (one from Judges and one from Audience). One of each Bonus Awards will be given to the video that best represents the spirit of that award's theme out of ALL entries. Awards will be submitted to all winners during the Award Ceremony, which is held during con. You do not have to be present at the con to receive your award but it would be nice if you were. Any awards unclaimed at con will be mailed out. Notice!!! Fanime Con 2013 reserves the right to make amendments to the rules at any time. This year was a pretty great show. While this year had its challenges behind the scenes, the show came out great (Big thanks to my FMV Dept. 2nd Tiffany Dailey). So to everyone that submitted: Thank you! We would not have a show with out you. The winners are now posted here and on animemusicvideos.org along with the line up info for the videos. Also, once again, I have received many, many request to see this year's entries online. We will be contacting the editors and hoping that they can provide a link to their videos. So if you submitted an entry this year and would like to have people check out your entry, please send a link to your posted video to fmv@fanime.com or josemarin7_15@yahoo.com with the subject "Show Off My 2012 FMV!" We tried this last year and only got a couple of replies. Please send us your info! 1. What did you like? What worked for you? 2. What did you not like? Is there anything you feel needs to be improved? 3. What would you like to see from the show? Do you like animated shorts/trailers? Any ideas for prizes? What day would be preferred for the show? Stuff like that. Basically ANYTHING that comes to mind about ANYTHING related to FMV. Next year we want to revamp the show with new prizes and new categories. We have a few ideas in mind, but we would really like to hear yours too! We will also be working on getting a Fanime FMV Facebook page and Twitter for greater communication, feedback and exposure. Please be as honest as possible, but keep it respectful. The more feedback the better! If you have one sentence or a long response, that's great! The more we hear from you, the better we can make next year's show! We can't wait to hear back from everyone! 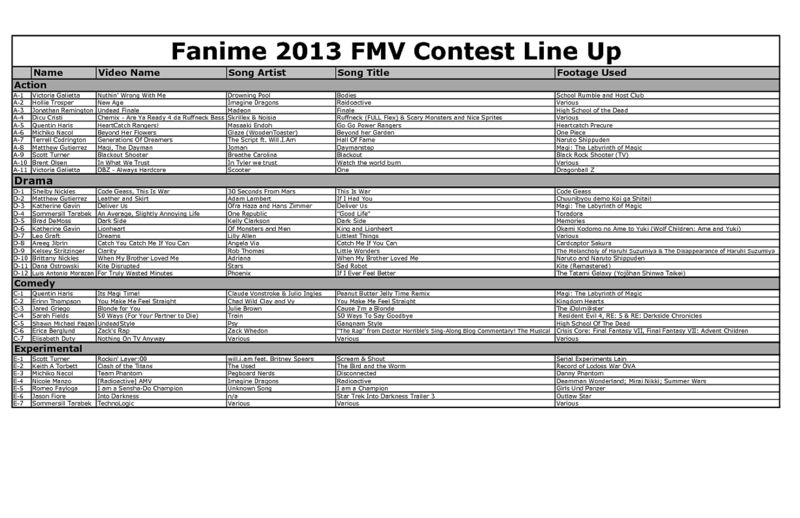 By popular demand, here is a copy of the FMV Contest Line Up Info! Video Programming / 2012 FMV Contest - Winners! Video: Its Di Gi Dubstep Nyo! NOTE: The winners for Audience Experimental had only a ONE point difference between each place!!! We will be mailing out all of the awards to those that could not be at the award ceremony. 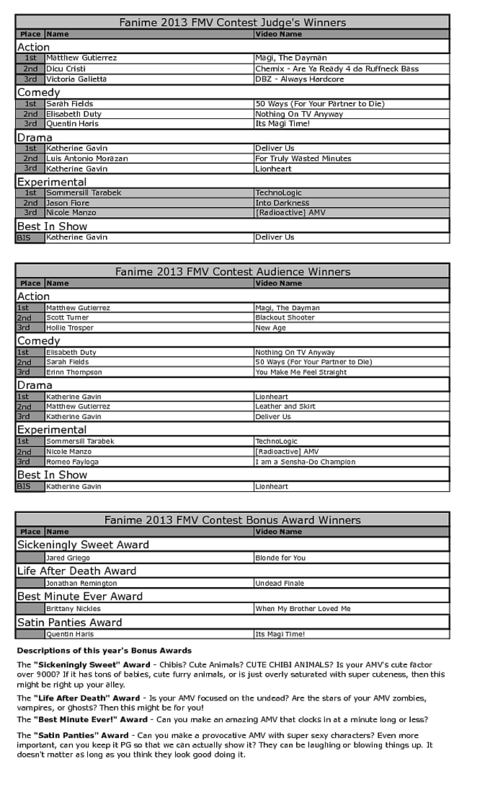 Video Programming / 2012 FMV Contest Award Show Schedule Change! We just got confirmation that the award show has been moved to 5pm at Stage Zero! By popular demand, we are posting the completed FMV Contest event schedule as a new post so it's easier to find. Please let us know if you have any questions, comments, or concerns. Cheers! Video Programming / 2012 FMV Contest Updates! Just a reminder that the deadline is this coming Monday April 30th, 2012! As of this posting (Thursday April 26th) we have sent out emails to ALL entries received. This means that if you are missing an email from us, please contact us ASAP!!! Also please check your emails for any messages regarding issues with videos. I know there were a couple. To make it easy for you though, you won't get an official confirmation email if we are still having issues. If you got the confirmation email, then your entries are working just fine. We've been getting loads of entries this week! I'd like to add that we've had a higher number of international entries this year as well. If you are an Editor in this year's contest you will have a separate line and preferred choice of seating. Please let us know that you're an Editor when you get there! Once again, we'd love to hear your thoughts. Feedback is key. Thanks! Here is your chance to make you voices heard regarding what you, our awesome fans and editors, want as prizes. Tell us early, tell us often, and we will make it happen. So far, gift cards have worked well, but we'd also like to give away audience prizes. Let us know what you would love to see there! Thanks! Video Programming / 2012 FMV Contest New Stuff! We've been working on some new stuff for this year's FMV Contest. First off, we will be posting updates as we near the deadlines for this years contest regarding the number of entries received in each category. We will also be posting previous year's numbers so that you can better decide what kind of FMV entry to submit. This comes from the overwhelming number of outstanding submissions we had last year in the Drama category. Sadly, we did not have a long enough show to accommodate all the totally show worthy FMV's. This brings me to our second addition (by popular demand). We have worked out an agreement with Stage Zero and we will be providing them with the FMV entries to play through out FanimeCon 2012. When and where they are played are up to the discretion of Stage Zero, however, this will give a chance to FMV entries that don't make the show a chance to be seen (and maybe draw a crowd and attention to your awesome work ) throughout the length of FanimeCon 2012. If you would like us to exclude your entry from the list given to Stage Zero, please let us know. If you have any more ideas or suggestions, please voice your thoughts. We're always happy to take note! Video Programming / 2012 FMV Contest Rules and Guidelines! All videos must be in the hands of the video coordinator no later than the Hard Deadline of midnight on Monday April 30th, 2012. Additional points will be awarded for all entries submitted on the Soft Deadline on or before Monday April 23rd, 2012. All videos submitted will be tested to make sure that there are no problems with playback. If there are any problems, there is a short amount of time to fix and/or resubmit your work. Remember this isn't school, so don't delay - submit A.S.A.P. Notice!!! Fanime Con 2012 reserves the right to make amendments to the rules at any time. Video Programming / FMV Contest 2011 - WINNERS! Here are the winners for this year's FMV Contest! Those who were not at the award show will have thier awards and respective prizes mailed to the address that was provided with your entry. Remember, all 1st Place Winners not only get an award certificate, but a $50 gift card to Best Buy. Best In Show Winners recieve and award certificate and a $100 gift card to Best Buy as well! So get those entries ready for next year's contest! Congratulations to all our winners and good luck next year! This year flat out rocked. I loved everything about working with this year's outstanding group of editors. So to everyone that submitted: Thank you! We would not have a show with out you. I will be posting the winners up on the forums tomorrow night for everyone to see. Also, I have received many, many request to see this year's entries online. I found out that while we are not allowed to post the videos online directly, we can post links directing people to the video. This would be great as we had to cut so many awesome entries due to the limited length of the FMV showing. So if you submitted an entry this year and would like to have people check out your entry, please send a link to your posted video to fmv@fanime.com or josemarin7_15@yahoo.com with the subject "Show Off My 2011 FMV!" *Keep in mind that we are aware of certian issues such as the lack of schedules, but please feel free to voice your opinion about that as well. I can't wait to hear back from everyone! I just wanted to post an event announcement for anyone who has not received word yet. 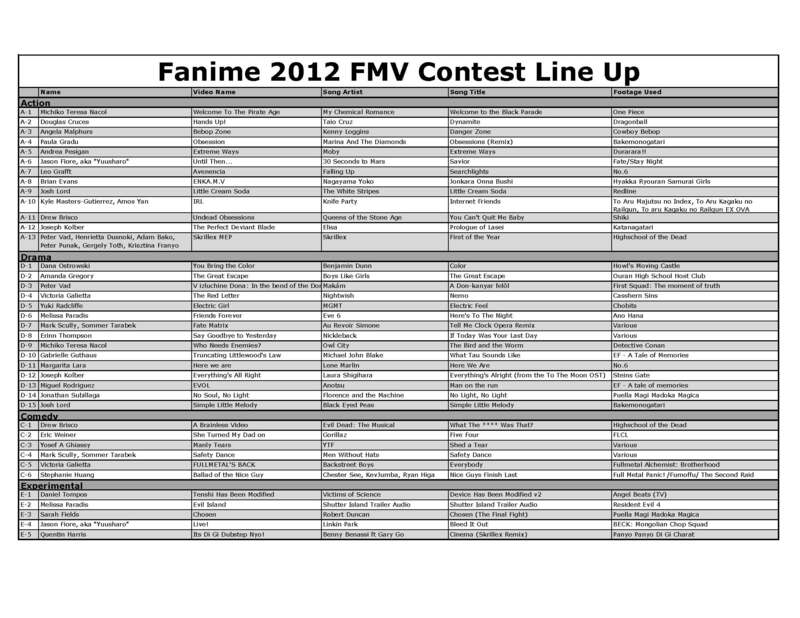 There will be three FMV Contest related events during FanimeCon 2011! 1. FMV Editors Meet and Greet! Come meet this year's editors. This will give everyone a chance to meet any contestants in the FMV Contest and pick their brains. This will be a great place to talk about the awesome AMV community and maybe learna trick or to about making AMV's! All editors that submitted an entry are invited, as well as any and all fans of AMVs! This will showcase all the great talent that the Fanime AMV community has brought forth. Come and check out the show. This is the main event! Back by popular demand for Fanime FMV Contest, we will be awarding prizes along with the awards for our 1st Place Winners and for Best In Show!!! We may even have a prize or two for audience members that attend!!! Who won? Come and cheers for your favorite video! We will be announcing the winners in Action, Drama, Comedy, Experimental, and, of course, Best In Show! This will showcase the top picks as chosen by our very own panel of Judges and of our Audience! Thinking of making an awesome AMV next year? Come and see what your competition will be! Video Programming / FMV Update!!! Deadline around the corner!!! This year's deadline is this coming Sunday May 8th at midnight! Also, if you have mailed or emailed a submission and have not received a reply, please contact us ASAP at fmv@fanime.com or josemarin7_15@yahoo.com . As of this posting, all current submissions have been processed and notification emails sent out. If you're waiting on one, don't delay!